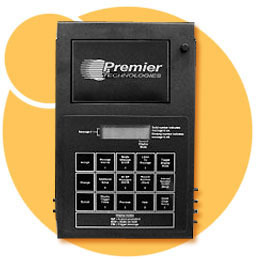 The 4500 is a solid state digital message repeater designed to inject messages over a background music feed. The messages are loaded into the unit through the cassette tape drive or a telephone handset. The unit accepts a live music feed, and then mixes the stored messages with the music feed. The 4500 can store two zones of messages that output at two different time intervals. Most commonly used as In-Store messaging and On-Hold messaging, the In-Store zone or zone two can also output daypart messages that play at a specified time of day. Flash Memory-The 4500 is equipped with the most advanced memory. The (NAND) flash memory assures the unit retains the messages and a program settings in the event of a power interruption. Automatic Mixing-The 4500 automatically mixes messages with background music from a live feed. Messages can be tape loaded or handset loaded. Re-Recordable Messages-Messages can be erased and rerecorded into any message position. New messages can be any length you want. The on board microprocessor realigns the memory for maximum efficient memory usage.